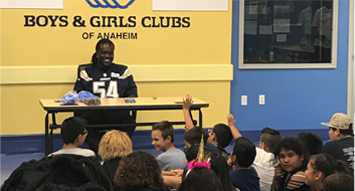 On Tuesday, Los Angeles Chargers Linebacker Melvin Ingram spent his afternoon at the Boys & Girls Club of Manzanita helping low-income children get “geared up” for a successful school year. Melvin personally distributed new Jordan Cinch backpacks and school bags filled with classroom supplies to 48 children who were selected by the Boys & Girls Club to participate in the program. Pencils, wristbands, and pocket schedules were provided by the Chargers. After receiving their brand-new gear, the excited children got to interact with Melvin, ask him questions, receive autographs, and take pictures with him. Inspired by the start of the NFL season, Melvin even started a game of touch football with the kids. All 48 students selected to participate by the Boys & Girls Club of Manzanita come from local single-parent households, many of whom live in impoverished inner-city communities. Because of financial limitations at home, most of these students are not afforded the opportunity to go back-to-school shopping and wind up returning to the classroom unprepared to take on the new year. Melvin’s ‘Gearing Up’ program ensures that economic factors do not prevent low-income students from being fully prepared to participate in classroom learning and excel throughout the remainder of the school year. This program is especially needed in Los Angeles, where 85% of the low-income children in the city cannot read at grade standards. 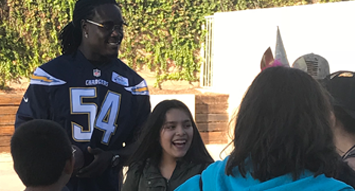 This is the first time that Gearing Up, which is a community outreach program of the Melvin Ingram’s Mission Possible Foundation, has been held since the Chargers’ move to Los Angeles. Ingram and his Foundation last held a back to school program in 2015, when dozens of San Diego’s most underprivileged children were provided backpacks for the upcoming school year. 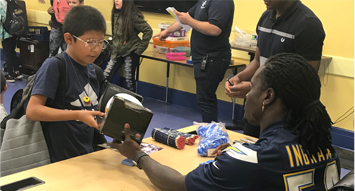 The mission of Melvin Ingram’s Mission Possible Foundation is to provide resources to financially disadvantaged children from single-parent families to help them reach their full potential and beat the odds. The Foundation was established in 2014.